programmed in the M2020. 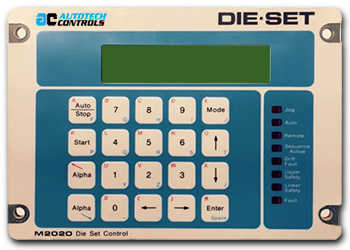 At die changeover, simply select the die number, press the start button and the DieSet will automatically position the die to the preprogrammed shut height. Typically, the 2020 pays for itself within the first few months of operation. M2020 supports single action press, while M2022 model is used for dual action presses. proper outputs to adjust the shut height to the proper preprogrammed position. Additional outputs are activated if travel limits or other certain faults occur. The DieSet features a 6-digit readout and displays the Shut-Height to 0.001” accuracy. The bright digital readout is extremely helpful in trouble shooting and fine tuning the press operation to produce high quality metal stampings. You know with complete certainty that the shut height has been adjusted to the highest accuracy. Height to the programmed Shut Height on every stroke of the press. In case the Shut Height has drifted beyond a programmed tolerance in either direction, a fault signal is produced to generate an alarm. Die I.D. box helps eliminate possible human error of selecting a wrong die during die change.The consequences of adjusting a die to wrong Shut Height can be catastrophic.With the Die I.D. box, the die identifies itself to the M2020, and M2020 automatically selects the right setup information. A die I.D. box, an 8 bit wired (code) plug, is required for each die. Electronic Back-up to OEM Travel Limits. minimum distance between the inner and the outer die Shut Heights. M2020 DieSet has two levels of security, that is two separate connections have to be made to allow changing the shut heights that have already been programmed, thus preventing unauthorized tampering that could cause serious damage to the dies and/or cause poor quality parts being produced by the press.